Woke up with a bad headache this morning. After finishing some work I laid down on the couch and closed my eyes. As I rested I thought about the Kavanagh/Ford dueling testimonies yesterday. An image based on the Gospel, According to Saint John, Chapter 8:4-11 (https://www.biblegateway.com/passage/?search=John+8%3A4-11&version=NRSV) came to mind. In my dream, I can’t see which one he says what to but I’m sure he’s speaking to us all! 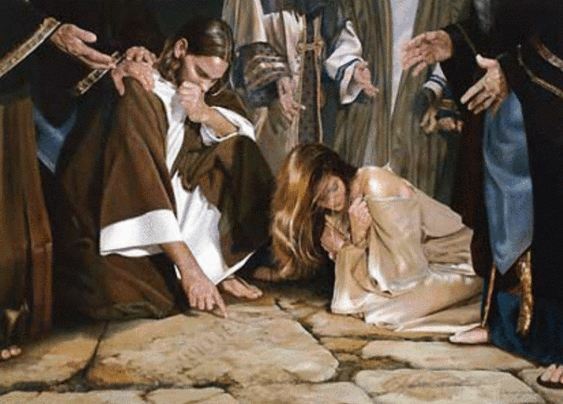 Posted on September 28, 2018, in Pastor, scripture reflection and tagged #accusers, #adultery, #arrogant, #bewildered, #blessings, #calm, #castavote, #castthefirststone, #Chapter8, #Committee, #commotion, #Confirmation, #demagogues, #demanding, #dueling, #firsttojudge, #Ford, #furious, #Goandsinnomore, #gospel, #hearing, #holiness, #humanbeings, #Judicial, #Kavanagh, #loving, #Nominating, #overzealous, #platitudes, #precioustime, #quoting, #rested, #SaintJohn, #Senate, #testimonies, #victims, #voice, #withoutsin, #Youareforgiven, #Youarefree, #YoureForgiven, #YoureFree, @BrianLoging, Religious. Bookmark the permalink. 1 Comment.